Yes, there is a giant cloud of alcohol in outer space. It’s in a region known as W3(OH), only about 6500 light years away. Unfortunately it is methyl alcohol (commonly known as wood alcohol, though this stuff is not derived from wood), so it isn’t suitable for drinking. There is some ethyl alcohol (the drinkable kind) there as well, but it’s not nearly as common. It might seem strange that there are alcohol clouds in space, but as noted in an earlier post, a great deal of complex molecular chemistry goes on between the molecular clouds and dust in outer space, and all sorts of chemical compounds exist there. Alcohol is a relatively simple molecule, made of relatively abundant elements (hydrogen, carbon, oxygen), so it shouldn’t be surprising that it exists in large quantities in space. While mention of an alcohol space cloud usually leads to snickers, there is actually some interesting astrophysics going on. Because of the abundance of similar simple molecules, adding a bit of energy to the mix can lead to a stimulated emission of light, known as an astrophysical maser. The term maser stands for Microwave Amplification by Stimulated Emission of Radiation. When the same effect occurs with visible light, it is called a laser. In fact the early lasers were known as optical masers. It’s the stimulated part that makes lasers and masers particularly interesting. Normally when an atom or molecule emits light, it happens randomly. The electrons of an atom have a bit of extra energy (are in an excited state), and they drop to a lower energy level by emitting a photon. This is known as spontaneous emission. Because of the quantum behavior of electrons, they can only move between specific discrete energy levels. This means the photons an atom or molecule emits have specific energies, and thus specific colors. This is also why emission spectra have specific patterns. But if an electron is in an excited state, and the molecule is struck by a photon, then the electron can be triggered to drop to a lower energy level and emit a photon. This is known as stimulated emission. The catch is that stimulated emission can’t be triggered by just any photon, it has to be triggered by a photon of the same energy the electron will emit. So what happens is a photon of just the right energy strikes the molecule, triggering a stimulated emission, and then the first photon and a new photon of the same energy go along their way. With stimulated emission, a photon can trigger a molecule to release a photon, and they can trigger even more molecules to release photons, causing a cascade of stimulated emission. Because the photons all move together (are coherent) the emission is very bright. Because they all have the same energy or color (are monochromatic), they are bright at that particular wavelength. With common lasers, the excited molecules are contained within an oscillation cavity, so the stimulated emission photons pass back and forth within the cavity (with each pass triggering more stimulated emission) before finally leaving as a very bright, monochromatic beam of light. This is why tiny laser pointers can make such a bright dot on your wall. Astrophysical masers don’t have an oscillation cavity, so the stimulated photons only make a single pass through the excited molecules. So the microwaves emitted aren’t quite as intense as the term “microwave laser” suggests. Still, astrophysical masers produce bright light at a narrow range of wavelengths. 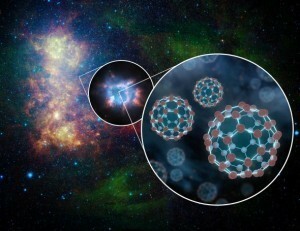 So what does this have to do with cosmic alcohol clouds? In order to trigger an astrophysical maser you need to have the right conditions. For one, you need a type of molecule with strong emission lines, such as methyl alcohol molecules. You also need them to be fairly concentrated, so that stimulated photons can hit other molecules to cause a cascade. An interstellar cloud of methyl alcohol will do nicely. Finally you need an energy source, such as protostars as they begin to heat up. Those exact conditions exist in W3(OH), because the alcohol cloud surrounds a stellar nursery. You can see this region in the image above. 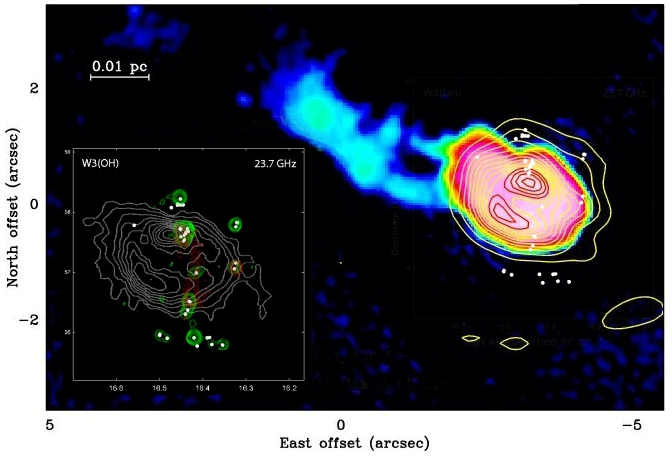 Here the alcohol cloud is seen as a false-color region, while the white dots indicate the locations of astrophysical masers. When masers were first invented in the 1950s, they were thought to be an entirely human creation. We now know that masers are a natural occurrence. All we needed was a bit of proof. I don’t get how emitted photons get the same direction as the initial photons ? Isn’t the incident photon absorbed during excitation?